Do you want to optimize your Amazon Listing? 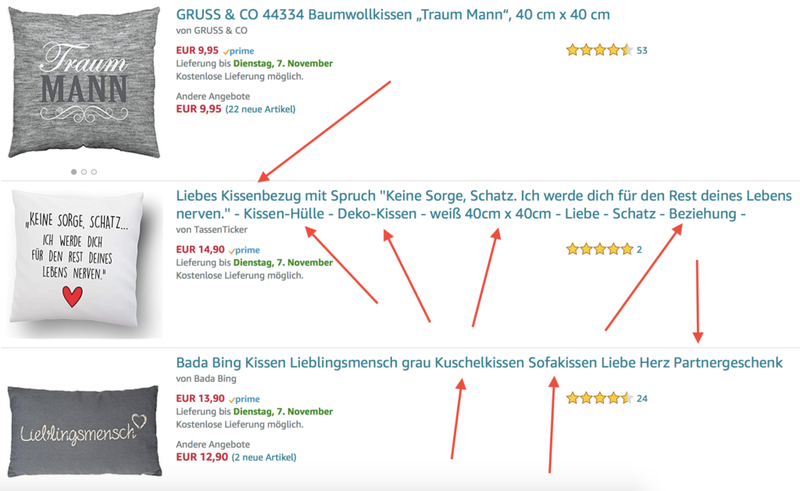 In this article, I present you my method for Amazon Listing Optimization. The prerequisite for a successful SEO Strategy is the Keyword Research. Whether for Google Optimization or Amazon Optimization there cannot be a lasting success without a thought-out concept for which Keywords you want to optimize your own contents. In a previous article I already picked out the systematic Keyword Research for Google Optimization as central theme. In this article, I will show you the procedure of the Keyword Research as well as the Amazon Listing Optimization. 1.5 Why are Keywords so important for the Amazon Listing Optimization? 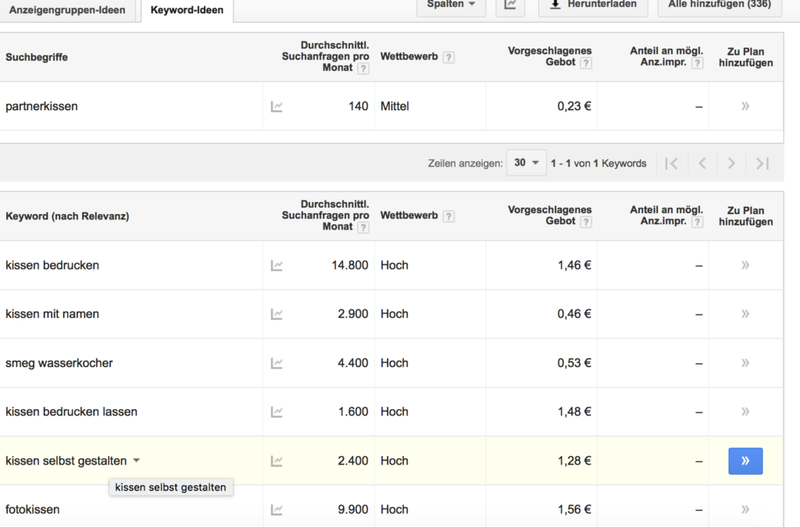 2.11 What is the difference between the columns Keyword and Search Queries? More than 50 % of online Product Search is started on Amazon therefore Amazon became the most important Product Search Machine in the last few years and even overtook Google in this area. Due to this more and more Seller are trying to position themselves on Amazon. The costumer’s intent to search on Amazon differs from his intent to search on Google, therefore you should know the different search intents and the differences between them to ensure lasting success. Information oriented Search Queries are made to answer certain questions (i.e. “Why does furniture delivery take so long?”). Considered from the Funnel Perspective the User who searches for information oriented Search Queries is in the upper part of the Sales Funnel. Therefore, the search usually rarely ends in a direct transaction. But still it is important to not underestimate the potential of those Search Queries because not only the decision to buy can be influenced but also the customer can be bond to the company. Usually information oriented Search Queries are made via Google Search. These Search Queries are focused on the transaction of a Product. These Search Queries are often referred as “Money-Keywords” because the User is at the lower part of the Sales Funnel, therefore a final transaction is more likely to happen. In the last years the search behaviour of transaction oriented Search Queries has shifted to Amazon. Using orientation based Search Queries, the User already has a clear goal (i.e. “Adidas Shoes Amazon”) and they are also most searched on Google. While people search on Amazon only for transaction oriented Search Queries, Google Search is dominated by orientation based Search Queries and information oriented Search Queries. 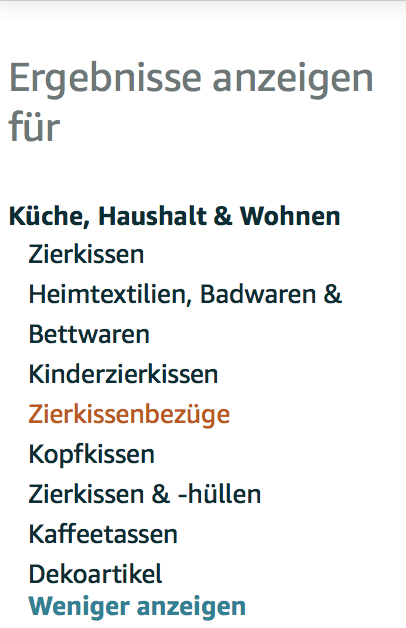 Therefore the two last mentioned type of Keywords are not relevant for the Keyword Research for Amazon Listings. 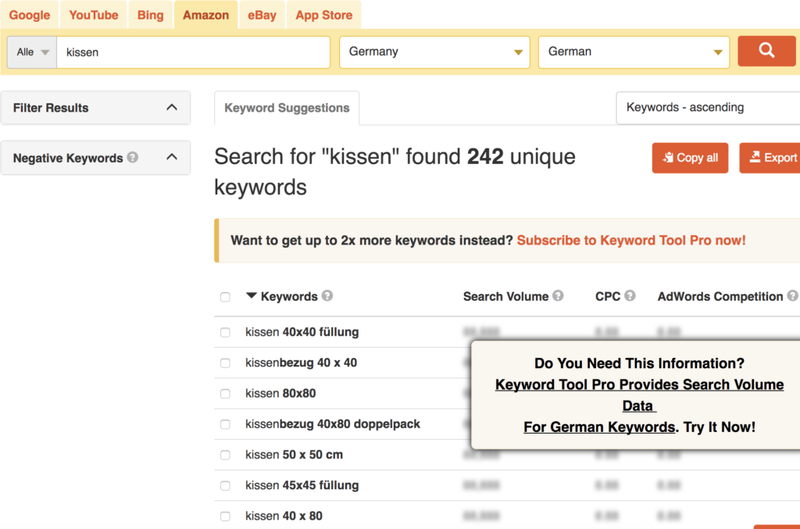 Why are Keywords so important for the Amazon Listing Optimization? Simplified said the Amazon-A9-Algorithm can be separated into two categories. Relevance Factors: Relevance Factors decide which Listings match with a Search Query. The Relevance is determined by the Keywords and the existing Product text. Only Products which contain the Keywords in their Product text (Title, Attributes, Backend-Keywords) are regarded as relevant. Depending on the position of the Keyword the relevance of the Keyword also differs. When a Keyword is positioned for example in the Title it has a higher relevance than when it is positioned in the Attributes. Performance Factors: Performance Factors have a direct influence on the purchase probability of a product. Especially CTR in the SERPS as well as the Conversion Rate of the Product Listing play an essential role. Factors that can be adjusted are the price, pictures, ratings as well as the delivery time. Conclusion: If the Keyword cannot be found in the product text there will be no purchase of the product. Because of that the Product text should be optimized from the beginning based on the prior Keyword Research. Only after the optimization of the Relevance Factors you should consider optimizing the Performance Factors. The Product Title is the most important Onpage Factor of an Amazon Listing. An optimized Title has several advantages: 1. A Title that contains the most important Keywords has a higher Chance to rank for these Search Queries. 2. An attractive Product Title which lists the advantages and functions of a product often has a high CTR in the SERPs. When optimizing the Product Title one should not only think of the algorithm but also of the consumer. The Product Title must not contain of more than 200 Bytes but you should take advantages of the Bytes that are available to you as much as you can because the longer a Product Title is the higher is the CTR. General Keywords can be compared to Meta-Tags from then, which are ineffective nowadays, with the difference that general Keywords are one of the most important Optimization Tools that can be adjusted and therefore should not be ignored. You can use 5 rows à 50 Bytes which you should take advantage of. Here you can also use Keywords that did not fit in the Product Title or the Attributes, especially synonyms can be used here. You should note that you should not use repetitions and commas instead use blanks to avoid waste important character. Moreover, use a hyphen to link Search Queries that can be written together or separated, by doing this you guarantee that Amazon will take both spellings into account. For example, write “Gift-Idea” instead of “Giftidea” or “Gift idea” so Amazon will take both styles into account instead of just one of them. Next, capitalization and the use of lowercases, vowel mutation as well as expletives have no effects so they can be ignored. Expletives like “for” or “with” are unnecessary as they just waste space that can be used for important and relevant Keywords. As well as the order of the Keywords has no importance and can also be ignored. Amazon-Platinum-Keywords are only relevant for so called Platinum Seller so if you are not one you do not have to fill the blanks for those Keywords because it would have any effects. To become an Amazon Platinum Seller one has to fulfil certain requirements and has to get invited by Amazon to participate in the Amazon-Seller-Programme. If you did not get invited yet you can be sure that you do not have the status of a Platinum Seller. Product Attributes/Bullet-Points should not be ignored in the optimization. Firstly they are the primary source of Information for a possible buyer and secondly they provide the needed place to integrate Keywords that have not been used yet. One should note that not only an optimization of the Keywords is important but also the display of the USP of your own Product. The Product Description is the least important factor in the assessment of relevance for Amazon. However one should not ignore it because of that rather use it to explain products that need additional explaining. It is the perfect place to use Longtail-Keywords. In addition one should know that your Amazon products are shown in the Google Search due to the fact that Google regards the Product Description thus one should not underestimate its worth. Now I will show you my method to optimize the Amazon Listing. This includes a Keyword Research for the Listing for the “All of me loves all of you – Pillow”. Prior to finding suitable Keywords, I create a Google-Sheet-Table to order the Keywords in different clusters. In my example I use following Cluster: Standard-Keywords, synonyms, occasions to give away, persons that receive a gift. Since this is an example for giftware both clusters occasions and persons are optional. Firstly I use the Amazon-Autosuggest as well as the listings of other competitors to gain first relevant Keywords. 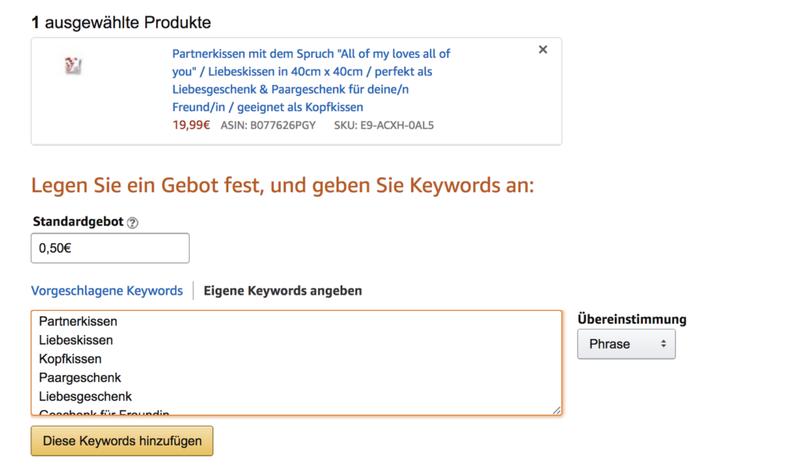 The more a Keywords is searched the higher and more present is the automated suggestion (Autosuggest) by Amazon therefore the majority of the Keyword Research can be done on Amazon. Now I fill the four columns with Keywords that are relevant to me. Beside the automated suggestions by Amazon I use already existing Product Listings by competitors to find suitable Keywords. As you can see in the picture, I already gained 8 Keywords that are relevant for my own Listing by analysing the Product Titles of the first Listings that already exist. But not only the Product Title can be helpful to find relevant Search Queries but also the Attributes and the Product Description. Moreover Amazon itself lists additional suggestions for Keywords that can be included in your Listing. In the left Sidebar on the Amazon-Desktop-View the field “show results for …” can be found. Different categories, where listed products are found, are shown there. I also use these categories to optimize my product listing. Especially the area “similar results” on Google can also be used to gain ideas for more Keywords. Next, I use my favourite Tool for the Keyword Research called Keywordtool.io. By choosing Amazon as Search Engine and searching for “pillow” I get a multitude of ideas for Keywords. Then I use the Tool sonor-tool.com to generate more Keywords. On sonor-tool.com you cannot only enter the Keywords but also the ASINs. By doing this the Keywords for each Product Listings are shown to you. Another great feature is the display of the search frequency of each Keyword on Amazon. 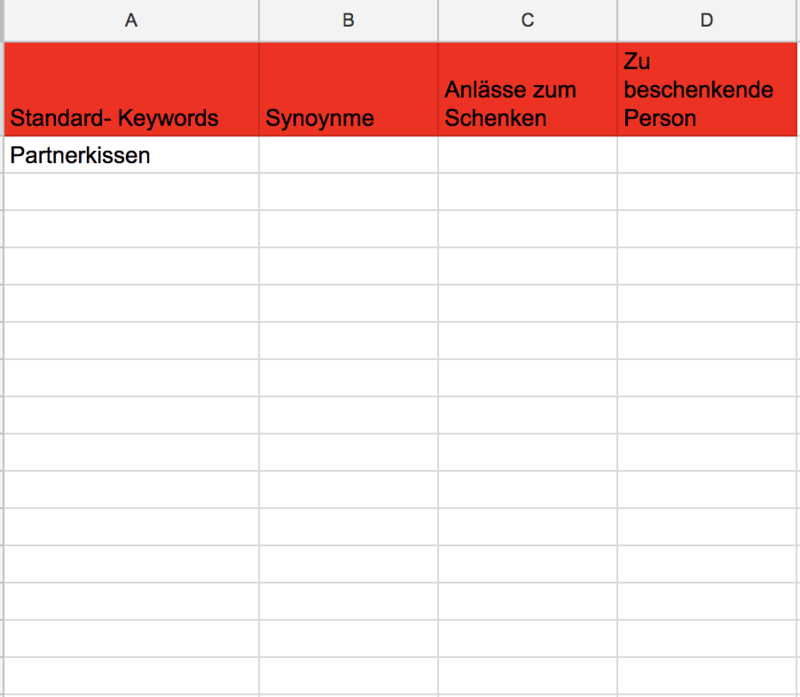 To ensure that I did not forget any Keywords I use the Google-Keyword-Planner in the last step. In addition it shows how often each Search Query was searched on Google in a month. In the Keyword-Planner I choose the option “Search with a word group, a Website or a category for Keywords. Then the Tool searches with the term “Partner Pillow” for more Search Queries. Now we have information on the respective Search Frequency and by using it we can now create and optimize our Amazon Listing. The Keyword Research is now completed. Of course there are other ways to carry out a Keyword Research. For example one can use automated Sponsored Product Campaigns to automatically accomplish a part of the Keyword Research. I begin with the creation and optimization of the Product Title, mind that the Title must not contain more than 200 Bytes and that only first 70 of them are visible in the mobile view. Secondly one creates the Amazon Attributes by using the most important Keywords. Here also exist limitations in the mobile view, only the first three Attributes are visible on mobile view therefore they should contain the most important information. In the following the Product Listing is shown. Of Course the general Keywords must be found in the Seller-Central. One should note that Keywords should not be used twice as well as the Limitation of 250 Bytes. Here I also show you which Search Queries I used. The maximal length of general Keywords is 250 Bytes and refers to all 5 fields and should not be crossed. You don’t have to use blanks and special character. Each letter from A-Z as well as each number from 0-9 count as 1 Byte. Whereas the Vowel mutations Ä, Ü and Ö count as 2 and the €-Symbol as 3 Bytes. An Amazon listing needs of course a Product Description. One should not ignore its relevance for the organic Amazon Search, the positive effect on the Conversion Rate as well as the Google Ranking. To individualize the formatting, I use a HTML-Editor to implement Headlines. Thus the Amazon Listing is completed but it is important to regularly revise the Amazon Listing especially after Information on the Conversion-Rate are available. Lastly I will show you exemplary how to start a Sponsored-Product-Campaign. Choose manage campaign under advertisement in the Seller-Central. After setting up the campaign and entering the Keywords I complete the manual campaign. Next to the manual campaign an automated campaign can be created to gain more Keywords through the advertisement report. Once the automated Sponsored-Product-Campaign ran a few weeks I can revise the Keyword Strategy with Information from the Keyword Report. To take a look at the Keyword Report you have to click on Advertisement Report under Reports. Here you can choose from 6 different reports (Performance in period, Performance regarding SKU, Performance regarding Placement, Keyword Report, other ASINs Reports and Performance Report of the Campaign). Choose the Keyword Report. On the following site you can request a Report or download one that already exists. The Report will be downloaded as Text-File therefore I open it in Google Spreadsheets to ensure a better overview. The Report gives Information on Search Queries made by the costumers, number of clicks, the CTR as well as the CPC and Conversion Rate. First identify Keywords that lead to a purchase of the product. When those Keywords cannot be found in our Listing they should be included. However Keywords that did not lead to a purchase but have a great relevance for the Listing should be included as well. Keywords that lead to a Conversion can be transferred to the manual Campaign. What is the difference between the columns Keyword and Search Queries? The listed Search Queries are precise Search Queries that were made by consumers on Amazon prior to our advertisement. Whereas Keyword is the Search Query that was used in the campaign. The Optimization of Amazon Listings as well as the systematic Keyword Research are tasks that should not be underestimated. Also the time needed to optimize the Product Listings should not be underestimated. One should know that the Process is not completed by creating and shaping the Listing, especially the systematic test (A/B Test) of Titles and Pictures can increase the Performance.